[118 Pages Report] The authentication services market is expected to grow from USD 507.0 Million in 2016 to USD 1,619.5 Million by 2022, at a Compound Annual Growth Rate (CAGR) of 21.1% during the forecast period. The scope of this research study covers the managed authentication services only. The base year considered for the study is 2016, and the forecast period is 2017–2022. Major drivers for the market is the growing number of digital identities and stringent data security regulations, such as PCI DSS and HIPAA. The research methodology used to estimate and forecast the authentication services market begins with capturing data on key vendor revenues and the market size of individual segments through secondary sources, such as industry associations and trade journals. The vendor offerings are also taken into consideration to determine market segmentation. The bottom-up procedure was employed to arrive at the overall market size of the market from the individual services technology segment. After arriving at the overall market size, the total market was split into several segments and subsegments, which were then verified through primary research by conducting extensive interviews with key industry personnel, such as CEOs, VPs, directors, and executives. The data triangulation and market breakdown procedures were employed to complete the overall market engineering process and arrive at the exact statistics for all segments and subsegments. 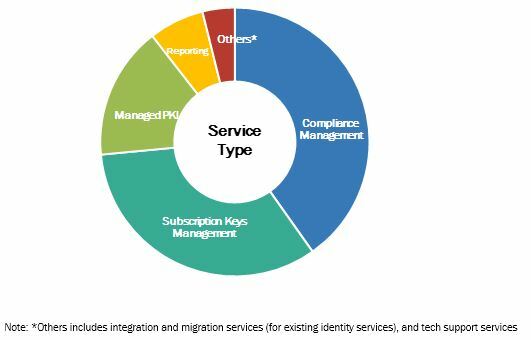 The authentication services market ecosystem includes players, such as Verizon (US), Trustwave (US), Gemalto (the Netherlands), Wipro (India), Tata Ccommunications (India), Bell Canada (Canada), GCI Channel Solutions (UK), Entrust Datacard (US), GCX (India), and Interoute (UK). The report on the market takes into account several technology segments, deployment types, solutions, and services to arrive at the global market size for the market during the forecast period. Managed authentication services are the practice of protecting the enterprise and its assets from identity fraud and any other cyber threats that may hamper the stability of the business process. The managed authentication services use various authentication techniques to validate and authorize user credentials in real-time. Managed authentication services is a subsegment of Identity and Access Management (IAM). IAM can be described as the management of individual identities, their authorization, and provision of access based on predefined rules. Companies struggled to meet the compliance demands, resulting in deploying solutions limited to few applications and systems. In recent times, to mitigate these threats, companies are adopting managed authentication services, which helps in compliance management, password, and access authentication, synchronizing identities between directories, and providing access to sensitive enterprise applications and data on users’ preferred mobile devices. These services not only provide the highly secure environment, but they are economical, save time, and have high operational efficiency and management control. The major factors driving the growth of the managed authentication services market are increasing number of digital identities, rise of mobile and soft tokens, and the company’s willingness to outsource security. Managed authentication services offer measurable business value in terms of increasing revenue, increasing number of digital identities, mobile soft tokens outpacing hard tokens, government agencies pushing for standardization of data security protocols, companies increasingly willing to outsource security, and enterprises heavily relying on mobile computing application to provide remote access options to their employees and partners resulting in greater flexibility and ease of working. 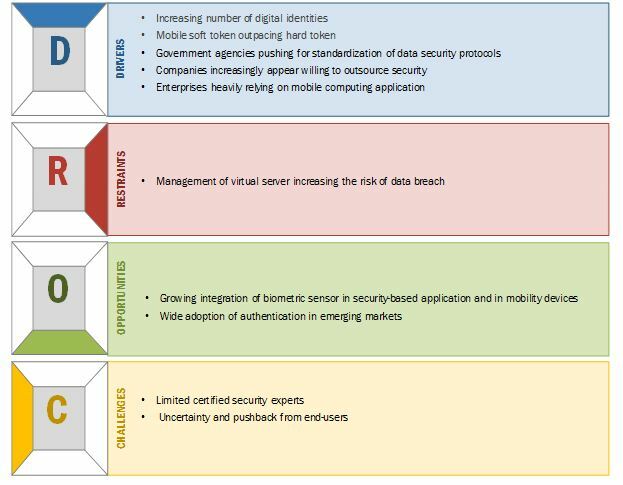 All these factors would greatly enhance the adoption of managed authentication services across various industry verticals, whereas, the growing integration of biometric sensor in security-based applications through smartphones, laptops, and tablets; the need for cloud-based authentication services; and wide adoption of authentication in emerging markets, provide enormous opportunities to the managed authentication services market. Biometrics technologies used in device identification and access control and authorized human recognition with the use of human physiological or behavioral characteristics, such as iris, fingerprints, face, palm prints, retina, and voice. The technology behind biometrics has become cheaper and more reliable, and it has resulted in companies integrating various biometrics into their existing security system. Authentication service providers are continuously developing and innovating the biometric-based authentication. The best advantage of biometric technology is that the person need not remember any password or Personal Identification Number (PIN), as the biometric identity is unique for every human being in the world. Hence, it creates a big challenge for a cyber-attacker to breach it and offers numerous opportunity in various industry verticals. BFSI and eCommerce industry is expected to create huge opportunity for authentication service vendors to offer biometric-based authentication services to their clients for better security and data protection. 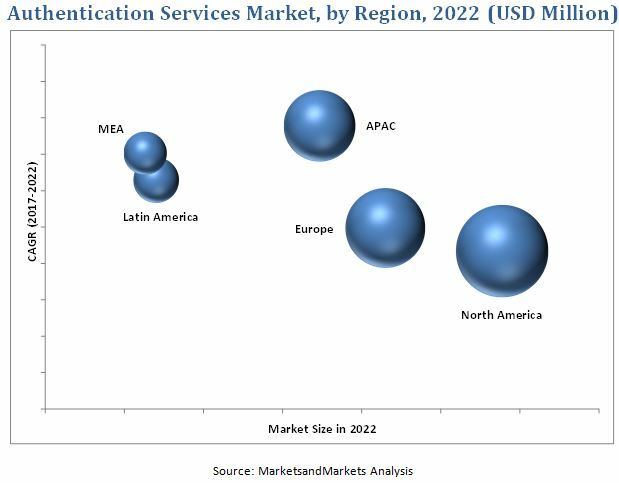 The authentication services market segmented by service, managed authentication type, managed tokenization type, vertical, and region. The managed PKI services is expected to hold the largest market share by growing at the highest CAGR during the forecast period. It is mainly due to an increasing need for managing and controlling large numbers of digital certificates for SSL, authentication, document signing, S/MIME, and other usages. Additionally, managed PKI services helps organization reduce the cost and burden of managing digital certificates. The eCommerce segment is expected to grow at the highest CAGR during the forecast period. The eCommerce vertical deals with selling consumer products and services to its clients through multiple channels. eCommerce is one of the top cost-conscious verticals and the most targeted by cyber-attackers, because of the potential payouts and a large number of monetary transactions via credit and debit cards. In addition, the increasing complexities of supply chain, employees, channel partners, and customers are expected to be forcing etailers to adopt authentication services. The Multi-Factor Authentication (MFA) segment is expected to hold the largest market share during the forecast period. Due to the increasing number of cyber-attacks and identity theft, organizations are implementing the two-factor authentication solution. The MFA adds an extra security layer and makes it more difficult for cyber criminals to breach an organization’s IT infrastructure. Additionally, various regulations and compliances, such as PCI DSS and GDPR, would drive the multifactor authentication segment’s growth. As per the geographic analysis, North America is expected to hold the largest market share during the forecast period. This is due to the presence of large managed security services providers, and stringent data security regulations and compliance in the region. The APAC region is expected to witness the fastest growth in the authentication services market, due to increaseing number of digital identities, online transactions, and mobile computing devices. Additinally, India, Japan, and Singapore have all updated or introduced new national cybersecurity policies that would ramp up the market. The major restraining factor for the growth of authentication services market would be the management of virtual server that is increasing the risk of data breach, increasing response time in higher order authentication model, and the increasing cost and technical complexity in implementing the multi-factor authentication solution. Major vendors profiled in the report include Verizon (US), Trustwave (US), Gemalto (the Netherlands), Wipro (India), Tata Communications (India), Bell Canada (Canada), GCI Channel Solutions (UK), Entrust Datacard (US), GCX (India), and Interoute (UK). The growth of authentication services market depends on the factors, such as Increasing number of digital identities, government agencies pushing for standardization of data security protocols, and enterprises heavily relying on mobile computing application. Various established players and new entrants in the industry are offering authentication services solutions to meet the varying needs of the industry. Compliance management is one of the major elements of today's security administration. It offers clients an unmistakable way of building up consistency, preventing data leaks, and implementing relevant strategies. Compliance management allows enterprises’ teams to centrally monitor and manage the IT compliance obligations. It helps in streamlining the Governance, Risk, and Compliance (GRC) efforts and in establishing the business and technical requirements needed for an effective information security program. Compliance management becomes even more crucial when the data or applications fall under Health Insurance Portability and Accountability Act (HIPAA), Sarbanes–Oxley Act (SOX), Family Educational Rights and Privacy Act (FERPA), PCI DSS, Gramm–Leach–Bliley Act (GLBA), or Basel compliance. For instance, PCI DSS is a standard developed by the credit card industry for ensuring the authentication of customers’ credit card information. The standard requires merchants and member service providers, who store, process, or transmit cardholder data, to build and maintain a secure IT network, protect cardholder data, maintain a vulnerability management program, implement strong access control measures, and regularly monitor and test networks. PCI DSS follows certain procedures to secure the credit card information that includes the installing of firewalls and anti-malware, and encrypting credit card data transmission. Hence, through compliance management services, organizations can adhere to and fulfill compliance requirement in an easy and cost-effective manner. Subscription keys management helps in managing and securing an enterprise’s subscription keys that are required during the activation of enterprise software and applications. It enables organizations to track the subscription keys for any software or application that they have purchased. Subscription keys management offers fast, reliable, secure, and easy-to-use services for the protection of the users’ keys. It also enables the clients to efficiently store, backup, protect, and organize the encryption keys. PKI enables organizations to manage large numbers of digital certificates for SSL, authentication, document signing, S/MIME, and other such usages of digital signatures. It helps in the secure transfer of data between the user and the server by authenticating the identity of the user. It encapsulates hardware, software, policies, and standards to manage the administration, distribution, and revocation of keys and digital certificates. An effective PKI consists of public key certificates, certificate repositories, certification authorities, registration authorities, and certificate management systems. Certificate authorities issue certificate and authenticate the identity of users, computers, and other computing devices. The KEY functions of the certificate authorities include generating key pairs, issuing digital certificates, publishing and verifying the certificates, and revocation of certificates. Registration authorities add an extra layer of security; they authenticate the person or company requesting the digital certificate to confirm their identity. Certificate management systems store and manage the issued certificates and certificate requests. Enterprises opt for managed PKI services, as they allow access to digital certificates without establishing, operating, and protecting the in-house certificate authority. Reporting is one of the important services that use the ready-to-use tool and service in generating and managing a report. It generates detailed logs about the user’s activity, which helps in security analysis and compliance auditing. A managed authentication report provides deep insights into the number of successful authentications, authentication activities, and the authentication methods used during a span of time. This reporting service comes with real-time fraud alerts. Whenever it detects a fraud activity, it sends alerts to the admin for locking out the user after a specified number of invalid logins. It also enables enterprises to mitigate risks by tracking the detailed logs and activities, and provides a complete list of the managed and unmanaged devices that connected to the enterprise applications. The other service types include integration and migration services (for existing identity services), and tech support services. The tech support services comprise the installation and ongoing support to help enterprises resolve frequent issues in their installed authentication services. Tech support services include 24/7 troubleshooting assistance, upgradation of the existing software, problem-solving, repairing, replacing failed components, proactive services, technical support by security experts, and test scenario management. Tech support services also include facility inspection and training, and round-the-clock support for the deployed authentication services. Integration and migration services help organizations in deploying and integrating new authentication services and migrating to new technologies as per their requirements and the systems’ compatibility. What new opportunities are generated through ongoing government initiatives for security protocols? Which are the top use cases where authentication services can be implemented for revenue generation through IoT and cloud services? What potential opportunities have augmented due to increased outsourcing of security services, and how are managed authentication service providers getting benefitted from it? Figure 9 Managed Public Key Infrastructure Segment is Expected to Hold the Largest Market Share During the Forecast Period.